You can configure Windows 10 to set the accent color automatically based on your wallpaper. However, if you don't like Windows to change the accent color everytime you change the wallpaper then you can manually set an accent color with just a few clicks. All you have to do is open the Settings app and go to "Personalization -> Colors" and select the accent color of your choice from the Windows Colors section appearing in the right panel. If you frequently change the accent color then there will be times when you want to use the accent color you used previously. The good thing is, Windows 10 got your back. Every time you change the accent color, the previous accent color is stored under the "Recent Colors" section which appears right above the "Windows Colors" section. The recent colors section can hold up to five color choices. The recent colors feature is added way back in build 15002. As good as it is, for whatever reason, if you want to clear recent colors in Windows 10, you can do that with just a few clicks. Let me show you how to clear recent colors history in Windows 10. 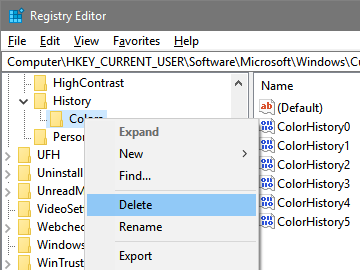 To clear recent colors history, we need to delete a registry key. Before doing that, backup registry. It just takes a few seconds at most. The registry backup will help restore your system in case of an emergency. 1. First, open Windows registry by searching for "regedit" in the start menu. 2. In the registry editor, copy the below path, paste it in the address bar and press enter. This action will automatically take you to the key we are looking for. On the right panel, you can see how Windows keeps track of all the recent colors. 2. As I said, we need to delete the key to clear recent colors history. So, right-click on the "Colors" key appearing on the left panel and select the option "Delete." 3. Windows will show a warning prompt. Just click on the "Yes" button to continue. 4. That is it. As you can see from below image, we have successfully clear recent colors in windows 10. After clearing the recent colors, Windows will replace them with the default colors. If you change the accent color again, the previous color will be automatically added to the recent colors section. If you don't want to manually clear recent colors, download this reg file, open or extract it to your desktop and double-click on the .reg file. Alternatively, open Notepad, copy and paste below code it in and click on "File > Save As." Now, save the file with .reg extension. In my case, I stored it as "clearRecentColors.reg". After creating the reg file, double-click on it. When prompted, click on the "Yes" button to continue. This action will clear the recent colors without you manually deleting the registry key. The best thing about this approach is that you can clear recent color whenever you want with ease. No need to manually open the registry and delete the key. Quick tip: if you are curious, you can open the downloaded reg file with Notepad or any other text editor to see what's in it. The file contains the same registry code shared above. Hope that helps. If you like this article, you will also like the quick tip on how to enable ultimate performace mode in Windows 10. Do check it out. Comment below sharing your thoughts and experiences about using the above method to clear recent colors in Windows 10.